I have to admit that reading all of the horror stories about Rio had me a little worried as I was planning this trip. Many travelers described being robbed as a necessary rite of passage for visitors to Rio and Cariocas alike. If you go to Rio, you’re going to get mugged, they all seemed to say. Now that I have returned from Rio, I can say that I did not, in fact, feel unsafe and did not get robbed or mugged or anything else. Of course, you have to be aware of your surroundings and not do anything stupid, and even then I’m sure it still happens, but at the very least, I’m here to tell you that it’s possible to experience Rio without having that other Rio experience. 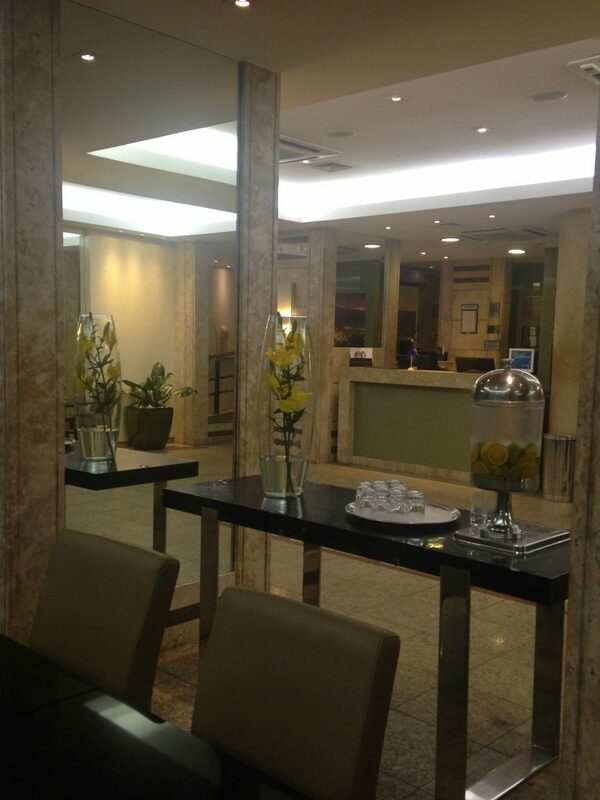 After researching hotels on Copacabana, Arpoador, Ipanema, and Leblon, I booked a room at the Golden Tulip Regente on the end of Copacabana closest to Arpoador and Ipanema because it had all of the qualifications I was looking for. Once I booked the hotel, I began to research how to get there from the airport. On their website, they mention having a car service, but good luck reaching these people by email. I have sent several emails to the hotel with various questions and have never received a response. Instead, I took a cab when I arrived at GIG in Rio, and it all worked out fine. I arrived at 11 am, which was a bit early for check in. Their check-out time is officially “midday” according to the literature in the room, so I figured I’d have to wait. When I approached the counter, the woman at reception was very friendly and spoke English very well. She automatically upgraded me to a business suite for free, which was such an awesome and much-appreciated surprise, provided me with a temporary wifi password, and gave me access to the rooftop pool if I wanted to wait there until my room was ready. I grabbed a bite and a caipirinha at the lobby bar and worked until 2 pm when they allowed me to check in early for free. Off to a great start! I’d like to mention one thing about the electrical outlets in Brazil that I found conflicting information for online before I left. Brazil used to use either American outlets or European outlets but has recently converted to a new type of outlet that is essentially the European plug with a third prong. European plugs still work in these outlets without the third prong. At hotel reception, they had US-European converters that you could borrow during your stay, as their rooms have been upgraded to the new three-pronged outlets. There is one American-style outlet in the downstairs bar, but if they remodel that area, I’m sure it will be upgraded eventually as well. There are so many rooms at this hotel, and the hallways are a bit of a maze. My room was at the far end of a long and winding hallway, which I didn’t mind because it felt more private. The hotel itself was always bustling with people and seemed to be fairly full all the time, to the point that I felt like I was never on the elevator by myself. The business suite had a comfortable king bed, a large desk equipped with outlets, a flat-screen TV, and a regular-sized bathroom, all of which was probably more space than I needed for just me, but it was nice to be able to spread out. The wifi worked great in the room at all times, although you had to login every 24 hours. 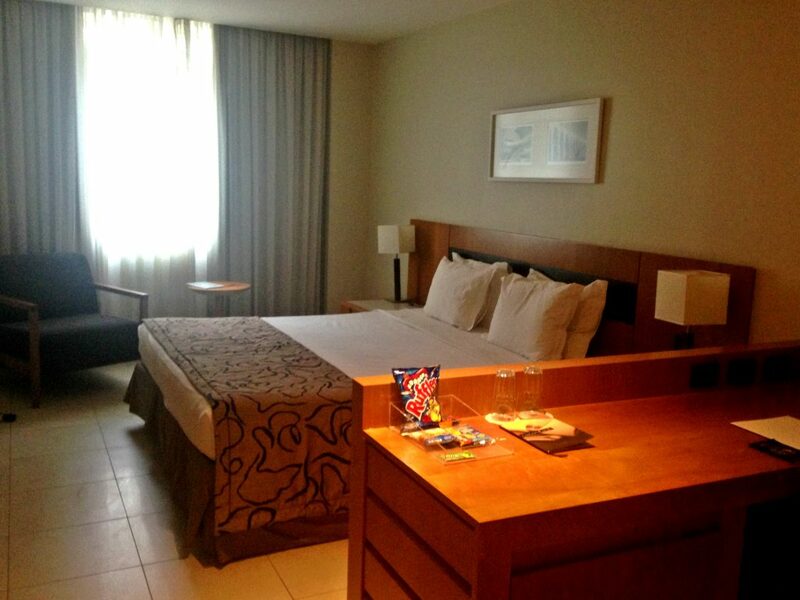 The room itself was decorated with light wood furniture, pictures of Rio on white walls with white tile floors, which made it a bit chilly but modern, and my window faced the street at the back of the hotel, where I could see a grocery store and a pharmacy. I love visiting grocery stores in other countries, so after settling in, I took a trip to the street behind the room for snacks and sunscreen. In Brazil, the produce and meat sections are unreal! When I travel by myself, my night owl tendencies can become very exaggerated, so scoping out late night food and drink when I’m up working or writing is a must. The minibar was stocked with water, drinks, and snacks that were the same price as the hotel bar, so if you wanted a coke, for example, it made no difference whether you walked downstairs and ordered it or took it out of the fridge, a nice change from the exorbitant minibar prices in the US. 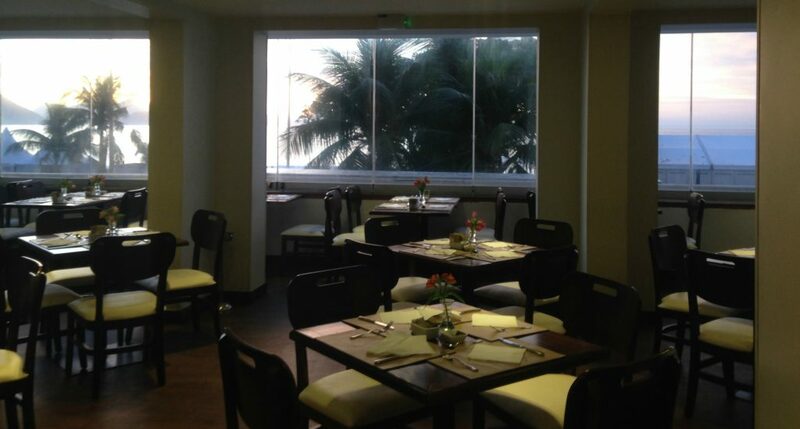 The hotel also offers 24-hour room service with a limited menu beginning after 10 pm at very reasonable prices. Satisfied with the room and stocked up on groceries, I ventured up to the rooftop pool. The view was amazing! 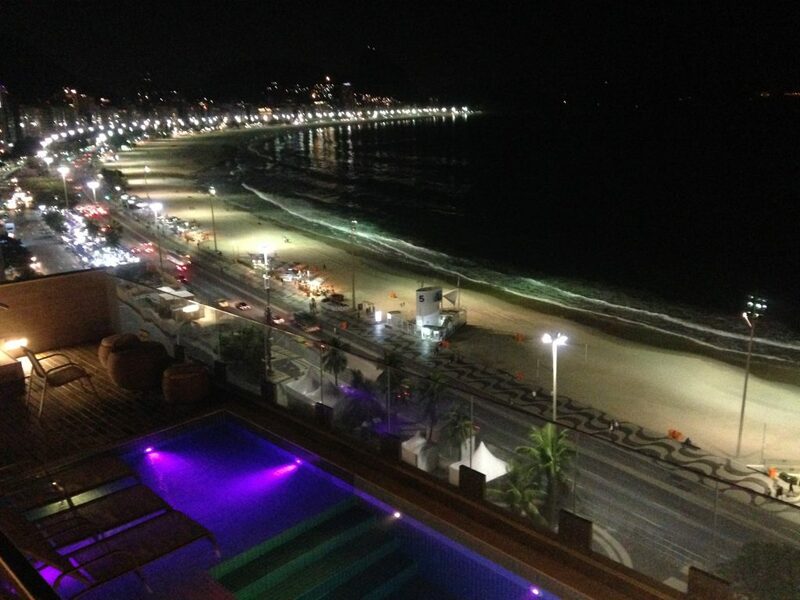 So worth booking this hotel for the view of Copacabana. The pool was big enough, not heated, but warm enough to get in and enjoy looking out at the beach. I spent many afternoons in the pool, reading on chairs in an elevated part of the pool, and on the lounge level above the pool where there were plenty of lounge chairs. The pool and pool lounge were heaven. The only downside was that the wifi sucked from up there. I would have worked for hours in the lounge if I had wifi. The pool bar had a small menu with sandwiches and small plates as well as cocktails and other refreshments. The attendant was often hard to find, and after 7 pm, you had to bring your own cocktails from the bar downstairs. That was a bit of a disappointment, but only in a world where you’re already spoiled by a rooftop pool overlooking the beach. There was also towel service here for the pool. 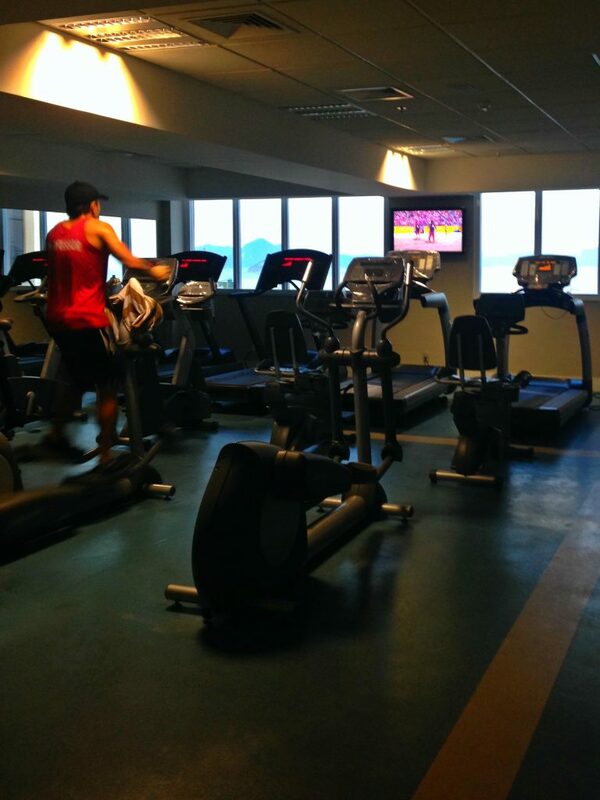 The gym also overlooked Copacabana, so you could be running on a treadmill watching the sunset in the evening. I can’t think of a better way to work out. When I was in the hotel at that time, I took some time to run while listening to podcasts about how to speak Brazilian Portuguese. You have to multitask! There were also stationary bikes and a few weight machines. After a quick workout, there was also a sauna to enjoy, and they offered massage appointments if desired. Because my sleeping schedule was so off, I was able to make it to the restaurant for breakfast most mornings when it opened, grab a table by the window and watch the sunrise over the beach. Unfortunately, there was construction impeding the complete view of the beach, but it was still breathtaking. The breakfast spread was very good for a hotel buffet. 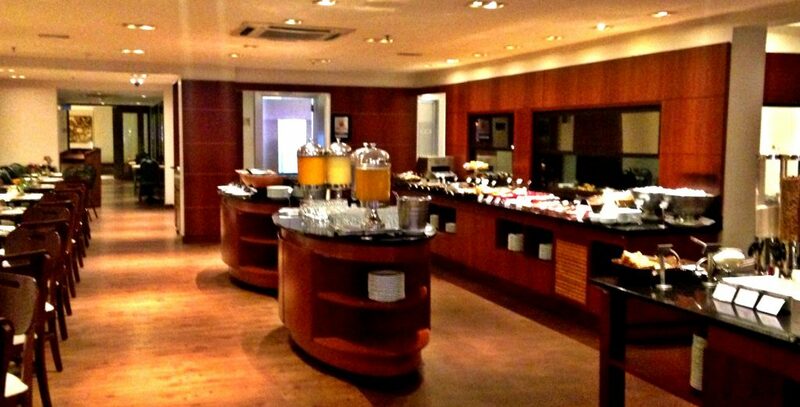 They had several types of eggs, meats, cheeses, lots of fruit, coffee and tea and an omelette station. Their pastry section was extensive and included local favorites like pão de queijo (cheesy doughballs). There were several types of fresh juices, and my favorite was a green juice that they named “detox juice”, which was a blend of herbs, mostly mint, and either orange or pineapple juice. I only ate at the restaurant one other time because they offered a feijoada buffet on Fridays. Feijoada is the Brazillian National dish, a stew of black beans and pork, and for lunch, the hotel restaurant, Forno e Fogão, offered a flat rate equivalent to around $25 for all-you-can-eat feijoada and all-you-can-drink caipirinhas with several types of fruit. 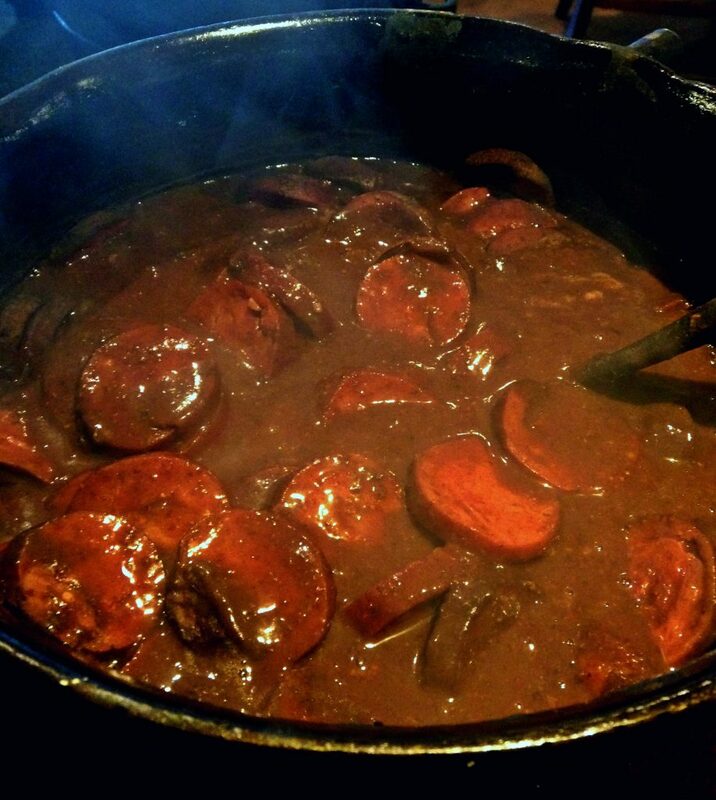 There were many varieties of feijoada, including vegetarian, pork rib, carne seca, two different types of sausage, and pork loin. It was a really great way to experience feijoada and drink cheaply. I highly recommend it. The tour list that the hotel provides is a lot more expensive than what you can book yourself. Because of the location of the hotel, all tour companies with hotel pickups would pick you up directly from the hotel, so I recommend looking elsewhere to arrange excursions. I used the Viator App on my iPhone and was very happy with my experience. Probably my least favorite hotel offering was the car service. They were far more expensive than a cab, and because the car service was offered, they would not call you a cab. There were plenty of cabs on Avenida Atlântica in front of the hotel, so it wasn’t a big deal, but it was annoying nonetheless. When I was leaving to go to the airport with all my bags, walking out to the street was a nuisance. I had them quote me a price to the airport, and when I rejected the price and said I’d hail a cab instead, their price came down significantly. I did meet a couple who was using Uber in Rio. I can’t recommend using Uber in Rio because I didn’t use the App myself, but they had no problems during their stay. I had a great experience at this hotel, and I felt like I got what I paid for. The room was nice and clean (the maid even knocked on my door to introduce herself and give me chocolates my first day), and the location was exactly what I was looking for, convenient to restaurants, the beach, and for exploring other parts of the city. Now that I’m far more comfortable exploring Rio on my own, I would likely opt to try Airbnb here because I would love to have a kitchen to cook in with all of the fresh produce and amazing looking meat. With a 10-year visa in hand, all I have to do is wait for another drop in flight prices! 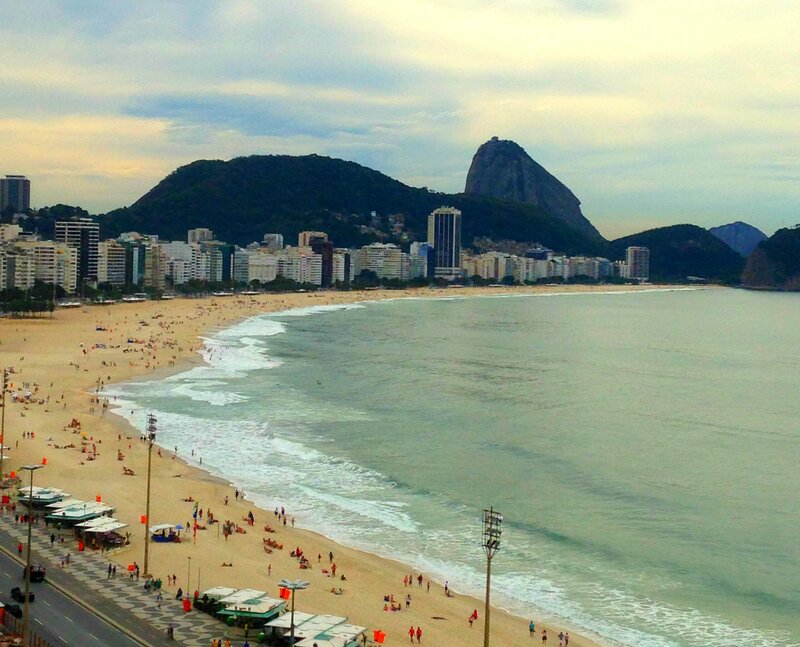 Previous Post Brazilian Visas for US citizens: So you want to go to Rio?